Are you having trouble staying on top of all your notifications and messages? With so many platforms available, it can get hectic - some people even use multiple phones to manage each specific platform. Facebook feels your pain, and today they've introduced a new update for the Facebook Pages app which enables businesses to link their Facebook, Messenger and Instagram accounts so that they can manage communications across all three channels in a single place. The new tools enable Page managers to stay on top of and respond to various interactions across the three platforms, including comments, visitor posts, reviews and messages. As you can see in the above image, each platform is now given its own dedicated, and distinctive tab within the app, with a separate color scheme for each, making it easy to switch between and respond to notifications as required. That color scheme is more than just aesthetic - the clear differentiation between each app is important, as it'll help ensure Page managers are always aware of which platform they're posting too, which can help with context and details. 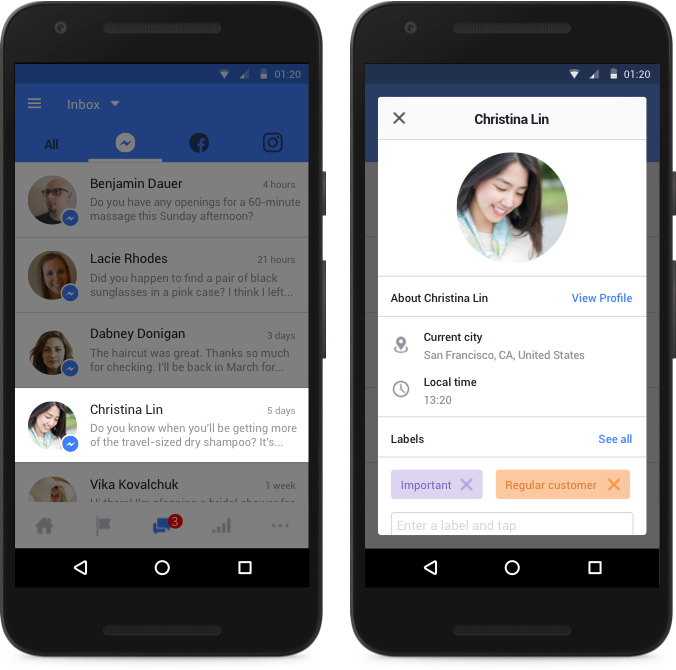 In addition to this, Facebook's also providing Page managers with a new way to access information about the people whom they're interacting with through their profiles - now, when you tap on a person's name within the Pages app, you'll be shown basic information from their profile, as well as any previous interactions with your business (this feature is currently available for all Facebook interactions in the inbox). It's a helpful update that will no doubt be welcomed by the many social media managers trying to wrangle multiple platforms and ensure they don't slip up by posting the wrong update to the wrong app. 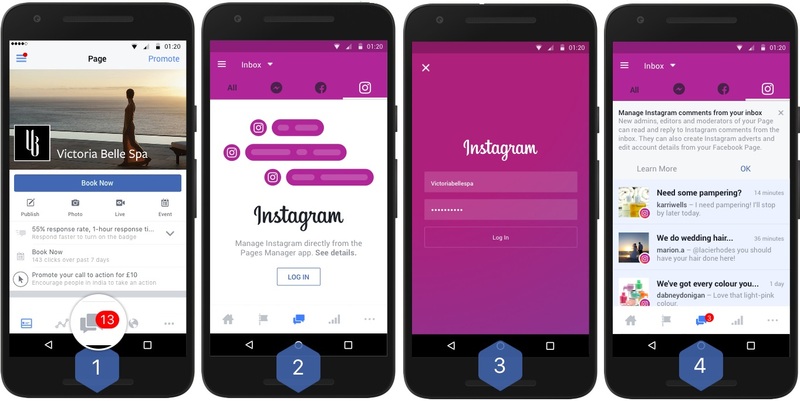 "Simply click on the messaging icon at the bottom of your Page while you're in the Pages Manager App, then navigate to the Instagram tab where you'll be prompted to log in." For those whose Instagram and Facebook accounts are already connected, the update will be applied automatically once available in your region.